Last week, National Geographic launched the campaign “I Am The Ocean“, also referred to as Mission Blue. This effort in partnership with several environmental organizations, including EDF, sends out a global call to action to raise public awareness, start conversations, and inspire people to help protect the ocean. One billion people worldwide depend on fish and shellfish for their protein. The ocean is key to sustaining life on the planet — from the air we breathe to the water we drink, so it is critical for us to protect it. Through this action-oriented marine conservation initiative, you can participate by making the right seafood choices, volunteering for costal clean-up, and learning about 10 other things you can do to save the ocean. In addition, you can even purchase a bottle of “I Am the Ocean” wine and $4 will be donated to promote marine protected areas and reduce overfishing. 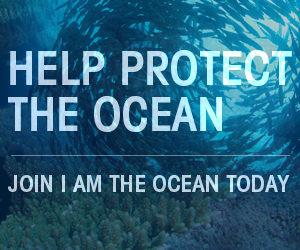 Join “I Am The Ocean” today. This entry was posted in Seafood and tagged Fishing, National Geographic, Oceans, Overfishing, Seafood. Bookmark the permalink. Both comments and trackbacks are currently closed.